From Software find themselves in a unique position. The Dark Souls creators remain one of the most distinctive developers around, and yet, most of their recent games have followed a similar blueprint. Plenty of fans are happy about that, as there’s still nothing quite like Dark Souls, but others would prefer they try something new. Well, it seems From Software is listening to the folks in the latter camp. Last year they launched the VR adventure Déraciné, and now we have Sekiro: Shadows Die Twice. Note: Wccftech previously published an “in-progress” version of this review. It’s now been updated with new details and a final score. Sekiro: Shadows Die Twice takes place during a less-than-historically-accurate version of Japan’s war-torn 16th century Sengoku period. You play as the titular Sekiro, a steely-eyed ninja sent to rescue the young heir to the throne, Lord Kuro, who is said to carry the divine power of resurrection in his blood. Unfortunately, you fail in your mission, losing your left and your young master in short order. But all is not lost – you awake from sure death with a new mechanical arm, crafted by a mysterious man known only as the Sculptor. It seems various forces, both worldly and otherworld, want to use Lord Kuro’s blood for their own purposes, but now they’re going to have to deal with a vengeful, newly-immortal ninja. Those bracing themselves for another cryptic Dark Souls or Bloodborne-style story will discover Sekiro tells its tale in a surprisingly straightforward way. The game has full-on cutscenes and characters speak plainly rather than in vague riddles. Some Soulsborne fanatics may chafe at this more traditional approach, but I enjoyed it. Personally, I’ve often found the fragmented “mysterious” Souls storytelling more irritating than absorbing. 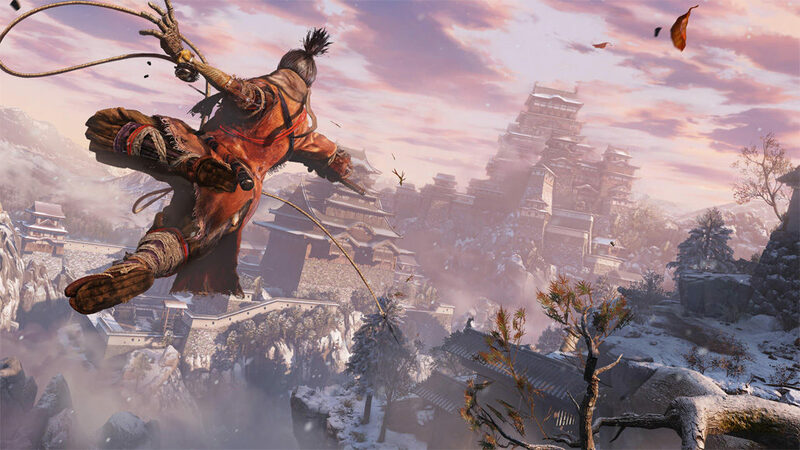 Yes, we’ve seen similar stories in any number of other samurai movies and games, but Sekiro’s setting is still an enticing one. There are plenty of interesting bits of color you can pick up by eavesdropping on various enemies and most of the game’s important NPCs have surprisingly deep, and usually rather tragic, backstories. 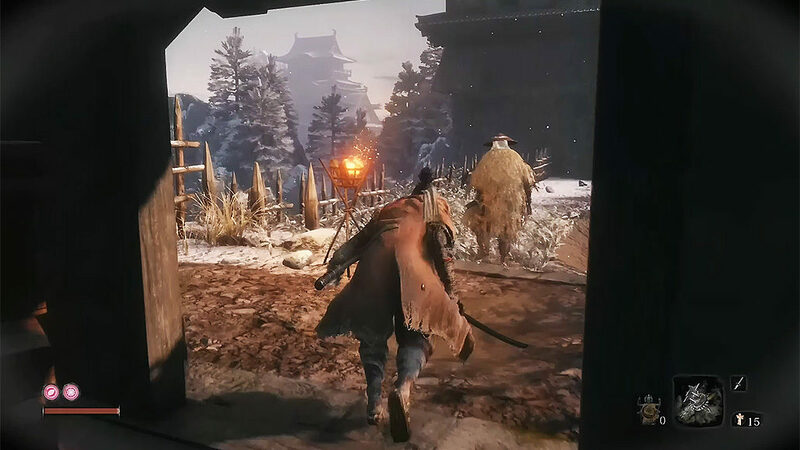 Of course, as with all From Software games, Sekiro also has multiple endings, and they cover a wide gamut, from impossibly bleak to almost uplifting. The passion the team at From had for this new world is clear from beginning to end. The clarity of Sekiro’s storytelling bleeds over into the game’s presentation. From Software announce their intentions right away, opening the game with a scene set in a forest awash with vibrant fall colors. While Sekiro still offers some dark, intimidating corners to explore, it isn’t as relentlessly murky as the Soulsborne games. Instead, the majority of areas in the game are crisp, bright, and beautiful, combining imposing architecture, natural splendor, and a healthy dose of the grotesque. Some performance hiccups aside, I love how this world looks and feels. Upon diving into Sekiro: Shadows Die Twice, longtime Souls fans will immediately note some pretty major changes. From Software is clearly trying to cast a wider net with this one, as the game begins with an honest-to-goodness tutorial level (a good one at that). You even get a handy sparring partner you can practice moves with. 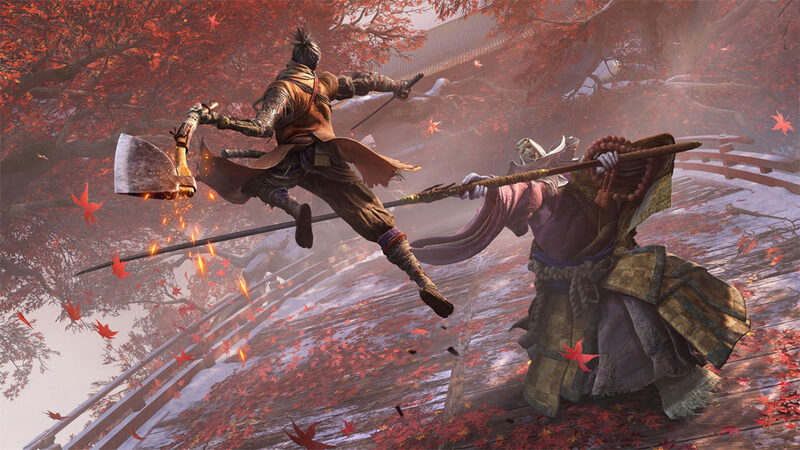 You’ll also be struck by how much more agile Sekiro is than the average lumbering From Software protagonist. He dashes around at a decent clip, and can jump, scramble up walls, and grapple over roofs like a Sengoku-era Spider-Man. As you venture deeper into the game, you’ll notices even more changes. The roguelike elements that formed the backbone of the Soulsborne games are gone, as is much of the RPG character building. In its place is a simple resurrection system. You can only get one extra life, but once you’ve used it, you can earn another resurrection charge easily by killing a few enemies or resting at a Bonfire-like Sculptor’s Idol. So, really, it’s only Game Over if you die twice in rapid succession (which, of course, happens fairly often). You can choose not to revive after your first fall, but there’s no real reward for doing so – it’s pretty much always worth it to bring yourself back, unless you know you’ve completely bungled a situation. Punishment for dying isn’t even that harsh, as you just lose half your Skill XP and money. That may sound bad, but once you earn enough XP for a skill point, it stays with you permanently, and there are ways to protect you money. Furthermore, enemies respawn when you die or rest at an Idol, making earning skill points relatively easy (you get access to a side mission of sorts early on that’s great for Skill XP grinding). Sometimes you’ll even be granted Unseen Aid from the gods when you perish, which spares you the loss of XP and cash. Dying repeatedly lowers your chance of getting Unseen Aid and spreads a disease called Dragonrot to the game’s NPCs, which locks off some sidequests, but there are ways to mitigate that too. I can’t say I ever faced any serious consequences for my frequent trips to the afterworld. Ultimately, Skill XP and money aren’t even that meaningful. Skills can be quite helpful, but none are essential for finishing the game, and money is only required intermittedly. Most of the important items you need to boost your Vitality (Prayer Beads), Attack power (Memories), healing charges (Gourd Seeds), and Shinobi Prosthetic abilities are found in the world or by beating bosses. This simplified action-adventure approach to progression works well enough, although you could argue it isn’t as elegantly realized as Dark Souls’ systems. 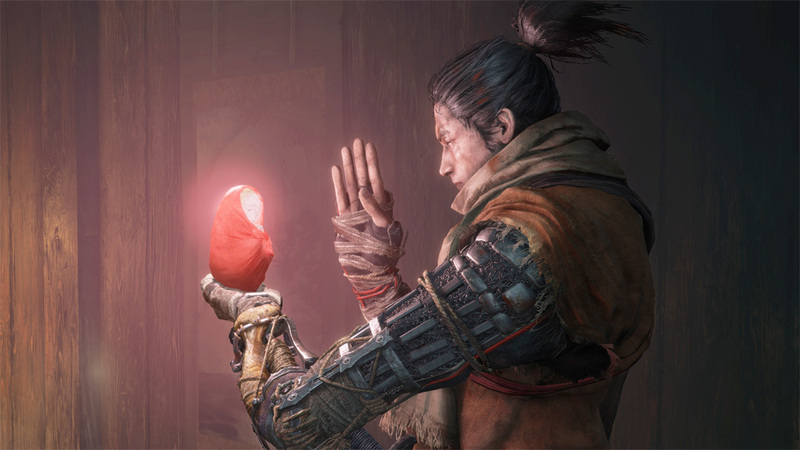 Of course, From Software had five games to perfect the Souls formula – it’s hard to get too upset at Sekiro for not having every little kink ironed out. 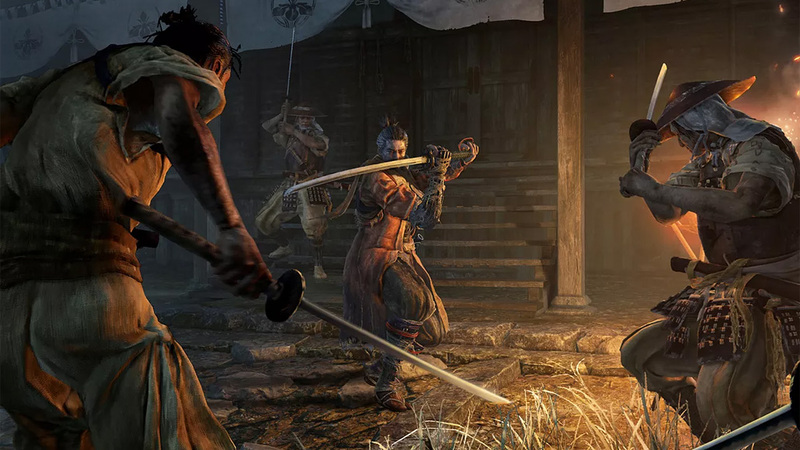 The one thing Sekiro unquestionably does better than the Soulsborne games is combat. Both you and the enemy have two meters you need to pay attention to – Posture and Vitality. The Posture meter is the more important of the two as maxing it out will stagger your opponent, allowing you to inflict a blood-geyser-producing deathblow. Deflections, counters, and attacks, both successful and blocked, weaken your opponent’s posture, but it will recover quickly if you leave them alone, so you’re encouraged to get in close and keep up the pressure. Vitality works more like a traditional health bar, with only successful attacks affecting it, although it doesn’t regenerate. The lower your opponent’s Vitality is, the slower they regain Posture, making it easier to stagger them the longer the fight wears on. Battles are fast and intense, but as long as you pay attention, you should always feel in control. The air of mysteriousness surrounding combat in previous From Software games has been dispelled. Everything about Serkiro’s combat is communicated very clearly, with the game going so far as to flash a big red indicator when the enemy is about to launch a particularly deadly attack. Don’t worry though, the new combat system being easy-to-understand doesn’t mean it’s easy. This game provides all the difficulty and depth you could hope for. While much of the character customization found in the Soulsborne games has be excised, there’s plenty of opportunity to combine your weapons, tools, and skills in unique ways. Sadly, combat also has a few minor blemishes that keep it from being quite as satisfying as it could be. The system is great when testing your blade one-on-one, but quickly devolves into an ugly melee when two or more enemies are involved (something that’s often hard to avoid). The game’s camera and targeting system can also be a bit on the finicky side. 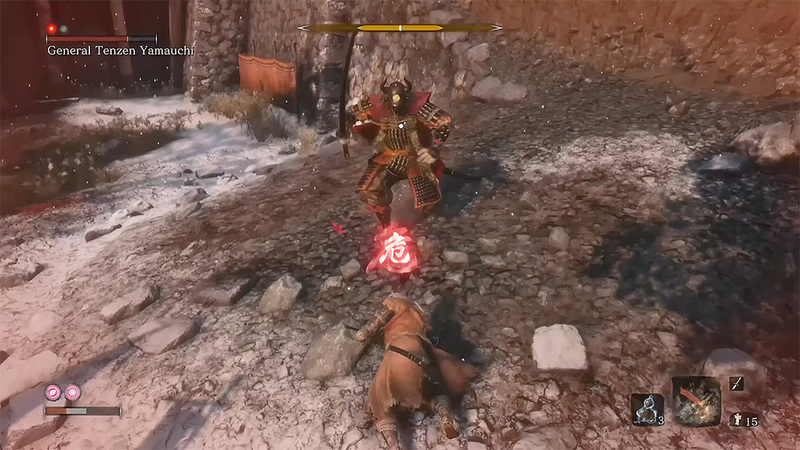 Sekiro’s combat is at its best during the game’s many punishing boss fights. From various ornery samurai, to a monstrous albino ape, to giant serpents and dragons, the game’s big baddies are wildly imaginative and varied, not to mention some of the most daunting challenges the folks at From have ever cooked up. Unlike in Dark Souls, where it sometimes felt like you could cheat your way past bosses by leveling up and taking advantage of exploits, Sekiro pretty much forces you to “git gud,” for lack of a better term. The path to defeating each new boss is the same — 1) Get immediately mashed in embarrassing fashion 2) Figure out what you need to do through painstaking trial and error…and then still lose 3) Memorize the boss’ every move until you feel like you’ve mind-melded with its AI 4) Squeak out a narrow victory at 2am and wake everybody in the house up celebrating. You’ll sweat, you’ll swear, you may throw a controller or two, but the satisfaction you’ll get from besting Sekiro’s bosses is a drug you can’t get anywhere else. That said, Sekiro’s bosses also highlight the combat’s few flaws. Your targeting is lost when you die and between boss phases, which can be just disorienting enough to throw you off your flow. I’d often win the first phase of a boss battle relatively easily, but then get immediately slaughtered when my camera suddenly wasn’t focused on my opponent. Sometimes you lose your target randomly (one boss, an intimidating horseback-riding samurai, is particularly bad for this). Some bosses also surround themselves with guards, who can turn a stiff challenge into a nearly insurmountable one. This brings me to Sekiro’s stealth. Yes, this game has a full stealth system, albeit a very simple one – you can sneak up on enemies for a covert instant kill, but there’s no vision cones, marking system, or any of the other tools you’d expect from a full stealth experience. The game’s AI is mostly braindead, following simple paths and not noticing when you’re impaling their buddies a foot behind their back. The stealth isn’t bad per se, it’s just doesn’t have that innovative spark you expect of From Software. Unfortunately, stealth can be downright frustrating when combined with the game’s bosses. As mentioned, some of the game’s minibosses surround themselves with a small army you pretty much have to stealthily take out if you want to stand a chance. That means every time you die against the boss, you also have to take out their posse again. You’re forced to repeat the least interesting part of the game too many times. Some issues aside, Sekiro’s overall flow and cadence is great. The game’s world has that familiar knotty, interconnected From Software structure, but it feels more open and less oppressive. Bosses are tough, but you’re nicely rewarded for defeating them with big new areas to explore or a helpful upgrade to your abilities. 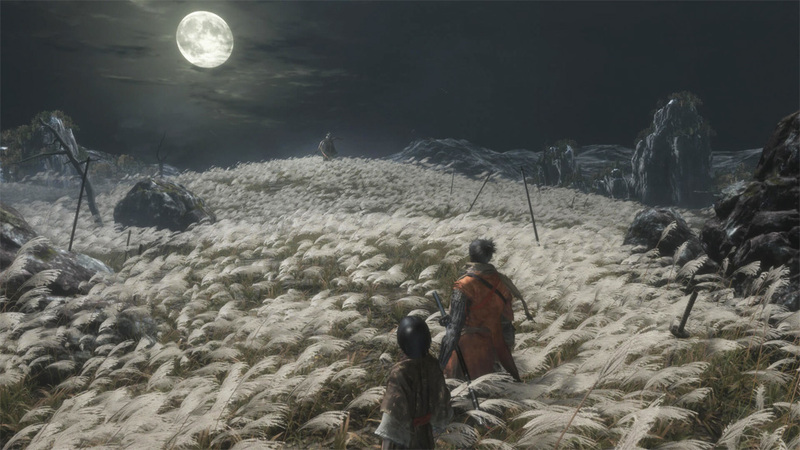 This is From Software’s most rewarding journey yet, and there’s a lot of journey to be had – Sekiro serves up about the same number of locations as your typical Dark Souls game, but it packs those areas with more challenges. This game serves up somewhere in the neighborhood of three dozen bosses. Expect a 30 to 50 hour adventure, depending on how sharp you’ve been keeping your blade. This review was based on a PS4 copy of Sekiro: Shadows Die Twice provided by publisher Activision. You can tell From Software was happy to try something a little different with Sekiro: Shadows Die Twice. The game has a few mechanical issues, which can largely be chalked up to new series jitters, but its energy and excitement mostly make up for its flaws. Yes, Sekiro can be downright sadistic at times, but those with the bushido (or plain old stubbornness) to face its challenges will have a bloody good time.